Check out this awesome embroidery design released in our Christmas collection! It features a beige teddy bear on a Christmas morning. He’s busy exploring the gifts wrapped in colorful paper and piled under the Christmas tree. 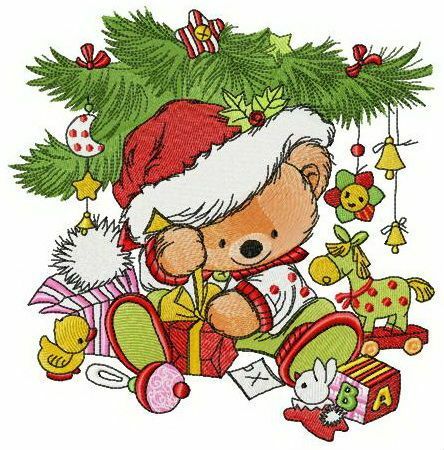 The teddy bear is wearing a polka dot outfit and a Santa hat decorated with holly. The Christmas tree is decorated merrily and the teddy bear seems to have loads of new toys to play with! Twenty-one colors make up a brilliant needlework which will serve as a perfect addition to various items: quilts, blankets, cushions, towels, bed linen, sweaters, pajamas, bathrobes and much more.